It was the lush green plant life framing the south-western coast of Sardinia which led to a stretch of 47 km to be called the Costa Verde – the Green Coast: junipers, lentisk, strawberry plants clothing the coastal countryside from Capo Pecora to Capo Frasca, amidst sand dunes, valleys, small villages and ancient abandoned mines. 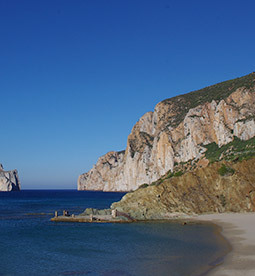 The Costa Verde, also known as the Marina di Arbus, faces on to the Sea of Sardinia and includes the small municipalities of Arbus and Fluminimaggiore, in the Province of the Medio Campidano. This is beautifully wild, spectacular coast, with sheer cliffs dropping down into an emerald sea and golden beaches with dunes rising to more than 60 m. The scenery also offers the imposing mass of Monte Arcuentu, the wetlands near the village of Sant'Antonio di Santadi, and the atmospheric mining heritage sites of Ingurtosu, Montevecchio and Buggerru. This is why the Bed & Breakfast Il Quinto Moro makes the perfect base camp to explore this splendid area of Sardinia, your info point and tour guide for the discovery of the history of the Geological and Mining Park, or just a relaxing stopover on a car or motorbike tour of the coast. 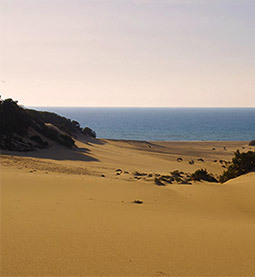 Trekking, hiking, walking, bird watching, surfing, surfcasting, snorkelling, potholing, archaeology, free climbing and bicycle tourism are just some of the activities which Il Quinto Moro Bed & Breakfast offers its guests: an active holiday in Sardinia aimed at the discovery of the Costa Verde.